Static Roots Festival | Limited hard tickets sold out – but we’re adding another batch! Home » News » Limited hard tickets sold out – but we’re adding another batch! Hooray – the first batch of limited hard tickets has been sold out this weekend! Thanks so much for your love, trust and support that most of you have placed in us. You’ve already ordered your tickets before the final announcement of the festival line up. This embodies your trust in us. And it clearly shows us, Static Roots Festival is more than just a line up. The artists are of course extremely important for the Static Roots Festival experience and their contribution is absolutely essential. But it’s you lovely folks who make this event so special. Thank you! 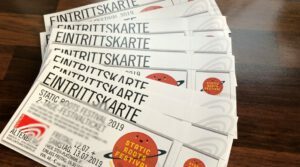 Sales went so well – we’ve organized another batch of hard tickets and continue selling them through our web page.